We meet again Nation! If you’re reading this then you must be a fan of opportunity and the unpredictable. I’m still trying to wrap my head around Jinder Mahal as the #1 contender for the WWE Championship for instance. Mind you I’m not complaining in the least as your weekly SmackDown chronicler. These surprises keep me on toes. The way things are going, Vince may read this very article and decide to strap a jet pack on my back and elevate me to head writer in the creative department. And to think, I thought I had high blood pressure now! Anyway,I’m getting off subject again. We’re now in week three of the superstar shake up and I’m going to shake things up right in this very column. It’s been brought to my attention that I don’t adequately transition from one segment to the next like most reviews. It seems I’ve been negligent in providing my own personal ratings on what we’re watching. Corporate is even calling for more bold type in my articles. And while the usual method of measuring quality of wrestling segments is taken in stars, as a loyal reader of my work, you know that’s just not my style. So as you read, be on the look out for how each match and interview segment ranks moving forward and remember that much like Whose Line is it Anyway, at the end of the day, the points really don’t count! And you stars out there, let’s just say I’m giving you the night off! On a side note, Papa Roach provided the official theme for Payback. That’s quite an accomplishment considering they died 10 years ago. And now here’s something that will get stuck in your head all day… Cut my life into pieces… this is my last resort…! Just a friendly reminder… The New Day is coming soon. Byron promises Tom and JBL an all-you-can-eat Booty-O’s Buffet upon their arrival. Just a little housekeeping to do before we move on. It turns out that the House of Horrors Match at Payback is not for the WWE Championship. Bray Wyatt will not be taking SmackDown’s championship over to Raw if he wins on Sunday and this also means that Wyatt won’t be jumping back to Tuesdays as he’ll be entrenched in a feud with Ambrose or Jericho or Miz or whatever the hell they are doing over there on the red brand. Renee speaks with Naomi in the Gorilla position. 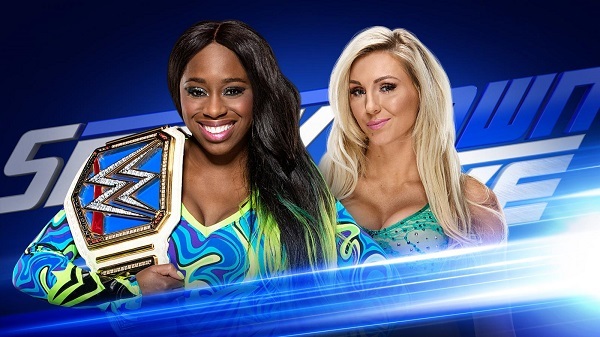 Naomi says Charlotte is a stand-up competitor but then calls her George Forman to Naomi’s Muhammed Ali. Old boxing references play well in Des Moine I guess. I feel like SmackDown Live is in experimental mode. What’s up is down and what’s down is up. If you were a perennial loser last month, you’re a main event player this month. If you’re the WWE Champion and own the top prize in the company, you’re fighting in the midcard and getting jumped by Jinder and the Bollywood Boys. If people thought you were on the chopping block, you’re now the #1 contenders for the tag team titles. That being said, how can you still be on the fence about this show? 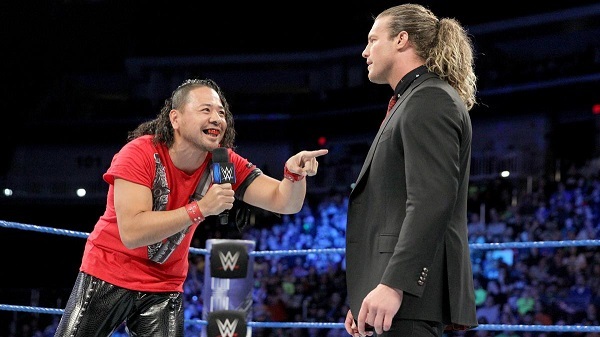 Shinsuke is here and about to mix it up with Dolph. AJ and Owens is at our fingertips. And the other two titles will have fresh matchups involving the old guard vs. some unfamiliar faces ready to make a statement. We’re in good place here folks. Take a moment, smell the roses, have a coffee and enjoy yourselves while leaving the complaining about the product to somebody else! FINAL GRADE: 4/5 ICED COFFEES Had enough or are you thirsty for more?